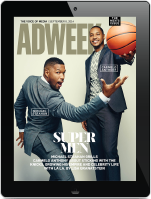 –Steph Curry makes a brief appearance in Duncan Channon’s new campaign for Rakuten (video above). -ICYMI: Publicis agreed to acquire a little data management company called Epsilon for an estimated $4.4 billion. -Here’s your roundup of the best Game of Thrones stunts. -The NRA filed a lawsuit accusing longtime agency partner Ackerman McQueen of refusing to comply with demands to justify the agency’s billings. -ComScore interim CEO Dave Fuller is attempting to reassure investors following the departures of CEO Bryan Weiner and president Sarah Hofstetter. -The Drum takes a look at Sir Martin Sorrell a year after his departure from WPP. -Carlsberg admits it was never the best beer in the world in campaign introducing its reimagined pilsner.